Like I said at the beginning of the month, that since March is my anniversary month of blogging I wanted to feature some of my favorite blogs that inspired me to start blogging. In addition to the Pioneer Woman Blog, The Hungry Housewife was a blog that I found in my early days of blogging. Leslie, The Hungry Housewife, is fun, tells ya like it is, and has some pretty darn good recipes too boot. She has made several appearances on her local news program in Tampa and has even appeared on the Home Shopping Network. Leslie features the whole gamete of recipes too. From desserts, and main entrees, and side dishes too. She even features easy ‘foodie crafts’ that you can make with your kids. As she has experimented and taken a stab with cake decorating and using fondant, sharing her cake works of art with her readers. Maybe this Hungry Housewife could start sharing some fondant tips and tricks since what she has shared so far have turned out pretty darn cute. Leslie does not blog and post new recipes daily as some blogs do; but the recipes she does blog about usually look and sound amazing. She has great photos and funny commentary. I am actually ashamed to admit that as much as I have enjoyed reading The Hungry Housewife Blog, that this is the first recipe from this blog I have tried. But let me tell you, this recipe convinced me that without a doubt I MUST try more Hungry Housewife recipes and stat! This Sheppard’s pie, which was a perfect way to celebrate St. Patrick’s Day, was THE BEST Sheppard’s Pie I have ever had. Now I hate labeling things as ‘THE BEST’ because obviously I have not tired ALL the Sheppard Pie recipes out there. But compared to ALL the ones I have tried this one is by far the best. It is not dry and is full of flavor; Eric and his sister and I kept ‘oohing’ and ‘ahing’ after each bite. 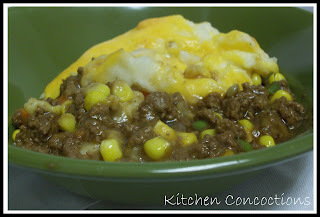 You MUST make this Sheppard’s Pie and you MUST go visit Leslie over at The Hungry Housewife Blog! Boil the potatoes in slated water until fork tender. Drain completely and place back in pot so all of the water evaporates. In a medium mixing bowl, mash/whip sour cream, butter garlic, and potatoes. Mash until smooth. Stir in 1/2 cup cheese and salt and pepper. Cook and drain ground beef. Place drained beef back in skillet and add 1 1/4 cup Guinness. Cook until beer has almost cooked out. Add tomato paste to meat. however, use 1 cup beer and 1 cup beef stock. Pour gravy into meat mixture. And cook all together until you get a nice thick gravy. In medium skillet with olive oil sauté onions until soft and translucent. Add mixed vegetables to the onions and cook until warm throughout. In a 9×13-inch baking dish, add meat as bottom layer, then add vegetables, and then add the mashed potatoes. Top with remaining shredded cheese. Cook at 375 for about 20 minutes or until cheese in nice and bubbly. WOW WOW WOW! I am blushing! What a sweet little write up! I can not thank you enough for the kind words. I am so very glad that I inspired you to start blogging! Thank you again, you are toooooo kind!